If you don’t mind my saying so, Caitlin, you seem young but you came to Spoonflower with a pretty impressive craft- and art-related resume already under your belt. Can you tell Spoonflower readers a bit more about your educational and professional experiences as they relate to fabric, design, crafting, and art? I promise I’m not that young! Before coming to Spoonflower, I worked in a number of museums in Texas–I received my Master’s in art history from the University of Texas at Austin–and at a summer camp in New Hampshire, my home state, as the arts and crafts director. While living in Austin, I also had the pleasure of working alongside some crafty people, including the gals at The WonderCraft and Jennifer Perkins of the Naughty Secretary Club, and I took some amazing embroidery and upholstery classes at The Stitch Lab and Spruce. I’ve sewn for a long time and when my husband and I moved to the DC area last year, I wound up working as a store manager in a local, family-owned fabric store. I spent most of my spare time then sewing, shopping for fabric, and reading fabric blogs, so it seemed like a logical place to be. My interest in and passion for fabrics grew while I was working there, and I quickly realized that this was an industry I loved and wanted to be a part of. Working at Spoonflower is truly a dream come true, and some days I can’t believe that I work in such an amazing place and get to do what I do. You must have become interested in fabrics and making things at a pretty young age. Did you come from a creative family? What made you decide to go into a creative field? I have my mom and my grandmother to thank for my sewing skills. I grew up in a house with a sewing room and a huge stash of fabrics because my mom also worked as a fabric store manager at one point. My grandmother and I sewed a number of projects together when I visited her during my childhood summers. I’ve always gravitated toward creative professions and without consciously meaning to; it seems I’ve almost always wound up working in places that are filled with beautiful things, whether they be paintings or fabrics. What sorts of creative pursuits do you enjoy when you’re not at work? I love quilting and embroidery, and I blog about all of my projects on my personal blog, Salty Oat. You and I are both members of our local chapter of the Modern Quilt Guild. 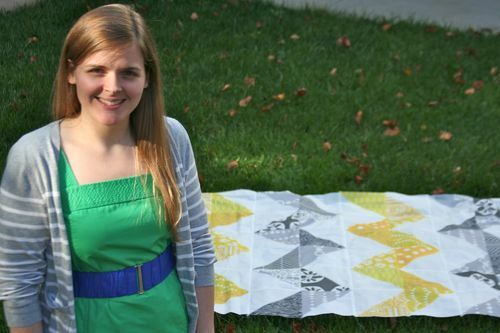 Do you consider yourself a modern quilter? What do you think is “modern” about the modern quilt movement and modern quilters? This is such a huge question and I know that there’s been lots of discussion about it within the community–with lots of people offering up far more eloquent responses than I ever could! Aesthetically speaking, I think “modern” quilts tend to have asymmetrical layouts, improvised piecing, solids, and traditional blocks done with unexpected color combinations or in a “wonky” style. I think quilts from the Amish and Gee’s Bend communities have been incredibly influential for many contemporary quilters. I’ve been quilting for about two years so I’m fairly new to it and am still defining my own style and aesthetic. But I do tend to gravitate toward more “modern” color palettes and layouts, and I love working with solids. You’ve been here just since the spring but have already moved into the role of sourcing our fabrics. What have you learned about this role so far? Are there any dream fabrics you’d love to see Spoonflower offer someday? Working in procurement, I order our fabrics and inks, work closely with our vendors to troubleshoot issues and arrange freight shipments, and research and test new fabrics. I’ve learned a lot about how our fabrics are produced and finished (and am still learning more! ), as well as what factors affect how well a fabric will load and print on our printers. I love that I get to work closely with both our administrative and operations teams, and have the chance to also work on the operations floor cutting, packing, and shipping our orders. As for dream fabrics, I’d love for us to offer a lighter-weight, natural-colored linen-cotton blend for use in quilting. There are a few other dream fabrics in the pipeline that I’m really excited about sharing with our community in the near future! What’s your current favorite Spoonflower fabric? I love the linen-cotton canvas. I’ve used it for tote bags, tea towels, and curtains, and currently have a laptop bag in the works. Do you have a current favorite design or designer on the site? I have so many favorite designs! Lately, I’ve been gravitating toward Clearlytangled’s Lotus Roots, Oksancia’s Succulents, and Lauren Hunt’s feathers. Is there anything else you’d like Spoonflower readers to know about you? I adore my dog Elton, drink far too many nonfat vanilla lattes, and am totally frightened by possums.